EXCLUSIVE! 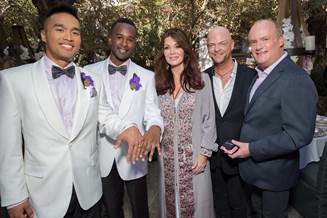 Lisa Vanderpump Marries Gay Couple – See The Vander-perfect Pics! Restaurateur, reality TV star, and… ordained minister?! Yup, Lisa Vanderpump officiated her first gay wedding, and only perezhilton.com has the Vander-perfect pics and wedding day details. The Real Housewives of Beverly Hills star wed Magno and Dominic Salva (above far left to right) on November 8 in the garden of her newest restaurant PUMP. 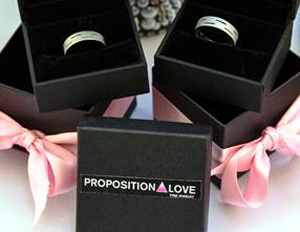 LOS ANGELES, CA – Proposition Love, a fine jewelry company that caters to LGBT couples will be featured on episode #18 of Bravo’s “Real Housewives of Beverly Hills,” Tuesday, March 17th on at 9pm EDT/PDT. Newly ordained minister and “housewife” Lisa Vanderpump officiates her first-ever wedding ceremony in the garden of her new restaurant/lounge PUMP in West Hollywood with Bravo camera’s capturing every exciting moment of partners Magno Salva and Dominic Pierson’s memorable moment. As the national LGBT marriage debate goes before the U.S. Supreme Court for a final decision this June, Proposition Love designed and donated rings and had the honor of presenting them to the couple on their wedding day. Sam Street and Jonathan Tack, founders of Proposition Love Jewelry, collaborated with Lisa Vanderpump to create the wedding rings for the first ceremony she was to officiate. Vanderpump worked with Street and Tack for weeks on the design of the rings, an interlocking motif crafted in white gold, symbolizing the love between newlyweds Dominic and Magno and the joining of their lives together. Prior to the wave of marriage equality sweeping the country, Street and Tack were married in California in 2008, as they couldn’t marry in their home state of New York. They are one of the 18,000 couples married during the short window of time before Prop 8 went into effect ending marriage equality in California. In preparation for the Supreme Court ruling, Proposition Love Jewelry created a video celebrating LOVE is LOVE with newlyweds Dominic and Magno, along with models Murray Swanby and Noah Wright and directed by Brad Hammer. The video can be viewed at: PropositionLove.com. Proposition Love designs unique and beautiful jewelry for the LGBTQ community and their straight allies. Proposition Love donates ten percent of profits from the sales of their jewelry to organizations that support Marriage Equality, gay rights, anti-bullying, LGBTQ youth and HIV/AIDS. Their entire line can be found at PropositionLove.com, as well as selected styles at Macys.com . The jewelry company donates ten percent of profits from the sales of their jewelry to organizations that support Marriage Equality, gay rights, anti-bullying, LGBTQ youth and HIV/AIDS. Proposition Love, a fine jewelry company that caters to LGBT couples will be featured on Episode 18 “Confessions of a Housewife”, airing this Tuesday, March 17th on at 9pm EDT/PDT on Bravo. Vanderpump worked with Sam Street and Jonathan Tack (the company founders) for weeks on the design of the rings, an interlocking motif crafted in white gold, symbolizing the love between newlyweds Dominic and Magno and the joining of their lives together. In preparation for the Supreme Court ruling, Proposition Love Jewelry created a video celebrating LOVE is LOVE with newlyweds Dominic and Magno, along with models Murray Swanby and Noah Wright and directed by Brad Hammer. Watch the video and get more information about the jewelry and company at: PropositionLove.com. Proposition Love, a fine jewelry company that caters to LGBT couples will be featured on episode #18 of Bravo’s “Real Housewives of Beverly Hills,” Tuesday, March 17th on at 9pm EDT/PDT.